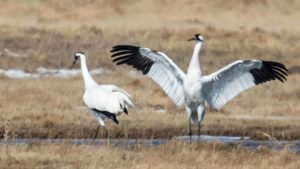 Indian reservations in North Dakota and South Dakota are providing huge amounts of “stopover habitat” for migrating wild whooping cranes. As Friends of the Wild Whoopers (FOTWW) wildlife biologist, I visited six of the reservations to evaluate numerous “stopover habitats” and to provide management recommendations”. I contacted the Great Plains Region Indian Headquarters to explain FOTWW’s whooping crane stopover habitat project. Regional Headquarters endorsed our efforts and furnished contact information for natural resource personnel on individual reservations. Natural resource personnel were then contacted on each reservation and FOTWW’s project explained to them. Each reservation wanted to be part of the project and invited FOTWW to visit them. The reservations FOTWW visited collectively have approximately 2.6 million hectares of land. There are approximately 1,000 permitted range units and 6,000 farm/pasture leases on 7 reservations. The permitted areas and farm/pasture leases are managed under reservation guidelines which are largely useful to wildlife. The headquarters reservation biologist (each reservation has a biologist) advised that there are over 1,700 potential stopover ponds/wetlands on the reservations within the whooping crane migration corridor. I made visits to each reservation: (1) to provide training for personnel about whooping crane stopover habitat needs, (2) to evaluate the habitats and (3) to make habitat management recommendations. Based on FOTWW field evaluations and accepted whooping crane habitat features, reservation natural resource personnel estimated that approximately 75% of the 1,700 ponds/wetlands could provide good stopover habitat, although some may require management criteria. FOTWW was very impressed with whooping crane stopover habitats and their management on all reservation sited that we visited. We were also pleased with the cooperative attitude of all personnel that we met with. Finally, during the field trips, FOTWW detected an activity of livestock that is potentially beneficial to whooping cranes. As noted above, whooping cranes do not use wetlands as stopover sites where tall, dense vegetation closely surrounds the pond shore, where predators may be lurking. 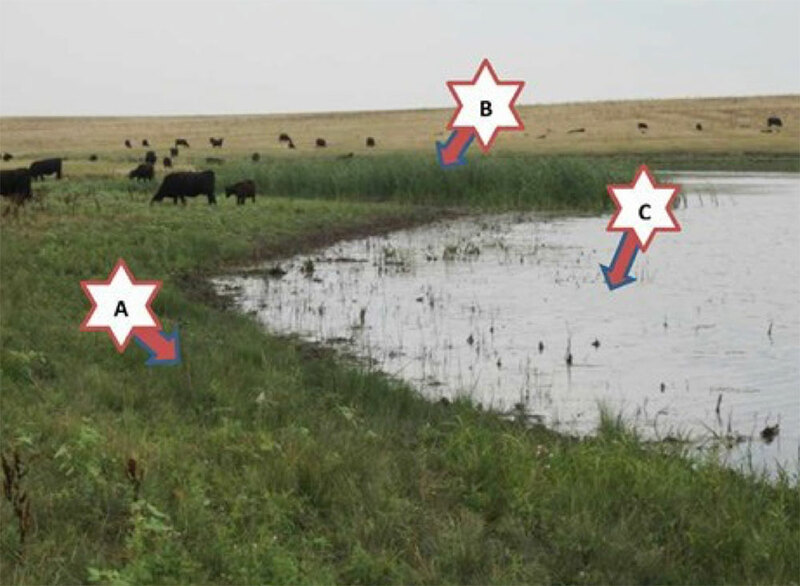 Around some ponds, we observed that livestock had grazed and trampled the vegetation when reaching a shallow area where they can safely enter the pond’s edge to obtain drinking water (Fig. 4). This resulted in unobstructed shore areas that would allow whooping cranes to use these ponds as stopover sites. Whooping cranes favor these same types of shallow areas with sparse vegetation to enter ponds to roost. We observed this phenomenon of vegetation trampling by livestock on numerous wetlands, especially in North and South Dakota. Thus, livestock pond water resources could incidentally provide additional suitable stopover habitat for whooping cranes. FOTWW has now completed whooping crane stopover habitat evaluations on all suitable military bases and Indian Reservations within the migration corridor. Management recommendation reports have been provided to all areas visited. Currently, we are evaluating Corps of Engineer Lakes within the migration corridor to locate, protect and manage stopover habitats for the only remaining wild Whooping Crane population on Earth. This work is being accomplished under a Cooperative Agreement with the Corps. Figure 1. 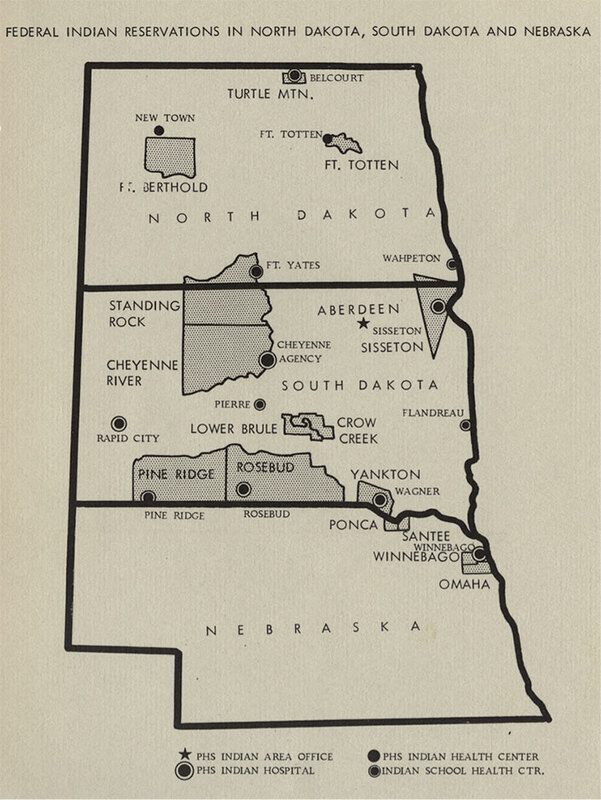 Map showing Indian Reservations in North Dakota, and South Dakota. Figure 2. Cheyenne River Indian Reservation Sioux Tribe, S.D. Pond / wetland useful as a stopover habitat for by Whooping Cranes. Young men in photo are in a tribal work-study project. FOTWW taught them about the features that make ponds/wetlands to be good stopover habitats. They learned rapidly and will be the future managers of the natural resources on the reservation. Figure 3. Spirit Lake Reservation, (Fort Totten) N.D. This reservation has many good stopover habitats. Flight glide path is clear of obstructions for Whooping Cranes to land near roosting sites. There is no tall grass or woody vegetation around most of this lake. Shore area is shallow with areas 5 to 10 inches deep for roosting sites. Sloped are gradual or gentle into lakes / ponds where water is shallow. Little or no emergent or submerged vegetation in lake at roost areas. There is extensive horizontal visibility from roost site so predators can be detected. Lake is 300 or more yards from human development or disturbance such as power lines. Foraging fields with grain crops and insects within one mile of stopover area. Figure 4. Pond with cattle grazing on Cheyenne River Sioux Reservation, South Dakota. Note that vegetation around portions of the shore is short (A) and cattail invasion (B) has been restricted due to livestock grazing. The shallow area (C) within the pond would provide suitable roosting sites for whooping cranes. The extended winter or late spring has delayed some migrations, and even though two whooping cranes were verified in North Dakota on March 29, it will probably still be later April before all these birds have worked their way through the state. Whenever that occurs, it’s likely that I will have gone another year without seeing one of these endangered birds alive in the wild. As a biologist, I practice what I preach and don’t intentionally go out looking for whooping cranes as they make their way from Aransas National Wildlife Refuge in Texas to Wood Buffalo National Park in Canada. That’s a distance of about 2,500 miles each way. Every year, the North Dakota Game and Fish Department and U.S. Fish and Wildlife Service put out a call for people to report sightings of these striking white birds, as a fair number of the 300 or so birds in the Aransas-Wood Buffalo population end up on the ground in North Dakota. Biologists receive several dozen reports a year, and in spring, the first reports typically come in the first week of April, which probably won’t be the case this year. Within two or three weeks in spring, the birds all move through North Dakota, but in fall the migration isn’t as urgent and reports can come in from late September stretching into late November, depending on weather. Over the next few weeks as that spring migration occurs, some lucky people will get a chance to report sightings so the birds can be tracked. These magnificent birds are regarded as unmistakable. I’ve seen them displayed in museums and they stand about five feet tall and have a wingspan of about seven feet from tip to tip. They are bright white with black wing tips, which are visible only when the wings are outspread. In flight, they extend their long necks straight forward, while their long, slender legs extend out behind the tail. 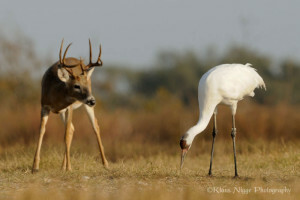 Whooping cranes typically migrate singly, or in groups of two to three birds and may be associated with sandhill cranes. Other white birds, such as snow geese, swans and egrets, are often mistaken for whooping cranes. The most common misidentification is pelicans, because their wingspan is similar and they tuck their pouch in flight, leaving a silhouette similar to a crane when viewed from below. Anyone sighting whoopers should not disturb them, but record the date, time, location and the birds’ activity. Observers also should look closely for and report colored bands which may occur on one or both legs. Whooping cranes have been marked with colored leg bands to help determine their identity. Whooping crane sightings should be reported to U.S. Fish and Wildlife Service offices at Lostwood, (701) 848-2466, or Long Lake, (701) 387-4397, national wildlife refuges; the state Game and Fish Department in Bismarck, (701) 328-6300, or to local game wardens across the state. 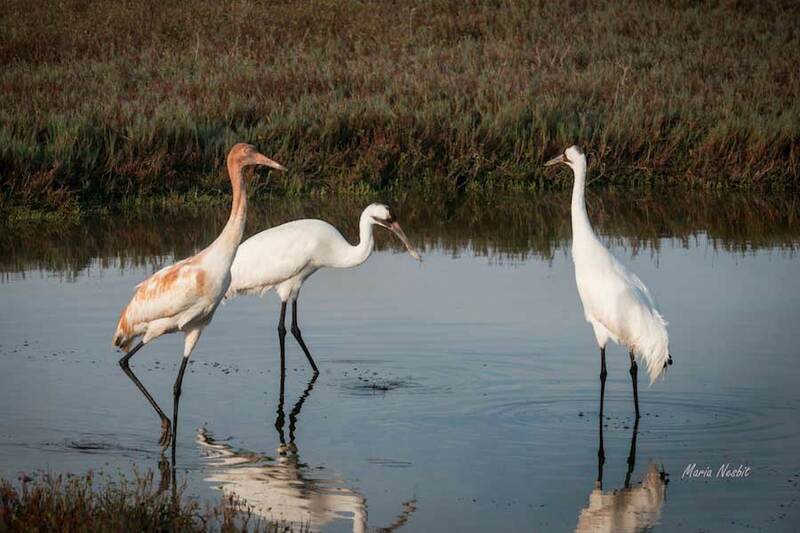 Reports help biologists locate important whooping crane habitat areas, monitor marked birds, determine survival and population numbers and identify times and migration routes. Figure 1. Two adults and one juvenile Whooping Cranes stop to rest and feed during their 2,500 mile migration between their Canadian nesting site and Aransas Refuge winter habitat on Texas coast. 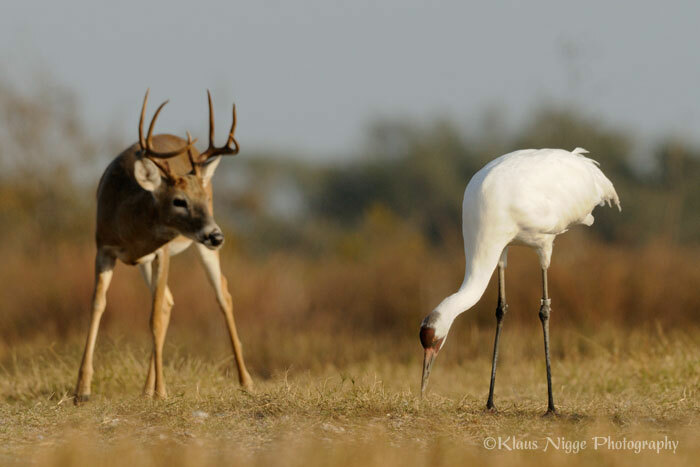 Indian Reservations in the Great Plains Region have an abundance of quality Whooping Crane “stopover habitats” according to Friends of the Wild Whoopers (FOTWW). Stopover habitats are ponds (stock dams) or other wetlands where the Whoopers stop to rest and feed for one or two nights during their two 2,500 mile migrations each year. Stopover habitats along their migration corridor are equally essential to the survival of Whooping Cranes as are their Canadian nesting sites and Aransas Refuge wintering habitats on the Texas coast. FOTWW is continuing its mission to identify, protect, enhance and develop existing or potential “stopover habitats” for the endangered wild cranes. Our wildlife biologist Chester McConnell, with the assistance of reservation biologists, recently completed a survey of tribal trust lands in the Great Plains Region. Seven Indian reservations involving 3.8 million acres of trust lands were visited. During the surveys McConnell instructs reservation biologist on habitat management practices necessary to make ponds/wetlands acceptable to Whooping Cranes. 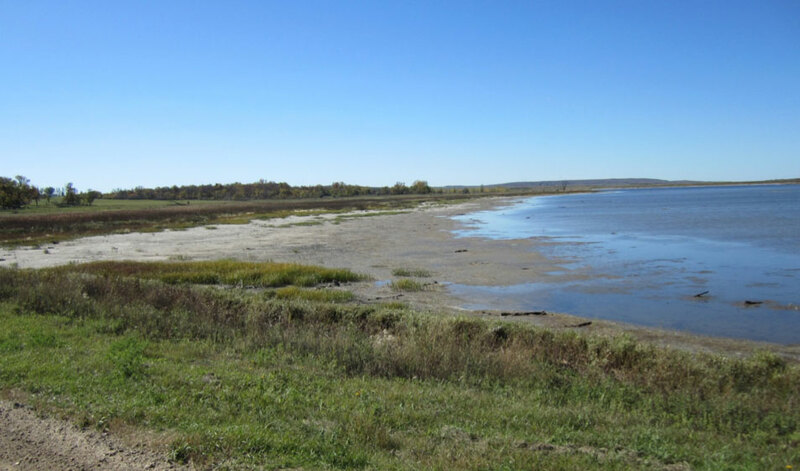 McConnell and reservation biologists identified over 1,700 potential stopover ponds/wetlands on Indian reservations in North Dakota and South Dakota within the Whooping Crane migration corridor. The biologists estimated that 75 percent of the 1,700 ponds would provide good “stopover habitat”. That equates to about 1,275 ponds. Figure 2. Numerous wildlife species use the same habitats as wild Whooping Cranes. FOTWW’s biologist explained that if needed some of the remaining 25 percent of ponds could be managed to become acceptable stopover areas with low cost management improvements. FOTWW believes, however, that there are currently enough stopover ponds within the 3.8 million acres of trust lands if their current management condition is maintained. Importantly, there is a continued need for more secure stopover ponds throughout the remainder of the Whooping Crane migration corridor. FOTWW recently completed another survey of these habitats on U.S. military bases in five states. Approximately 100 quality ponds were identified with 65 percent needing minor management. Importantly, more ponds on some military bases could become stopover sites if the need becomes apparent. Whooping Cranes migrate between northern Canada’s Wood Buffalo National Park nesting grounds and their Aransas National Wildlife Refuge wintering area on the Texas coast two times each year. During each of the 2,500 mile migrations the cranes stopover on wetlands/ponds/lakes and streams about 10 to 15 times. There they remain for a day or two to rest and feed. Regrettably, many “stopover habitats” are being destroyed or degraded on private property due to a variety of intensified developments. Insuring that sufficient areas are available with suitable conditions as stopover sites is important for survival of the species. Proactive approaches by land owners and managers can help reduce potential mortality that occurs during migration. FOTWW is concentrating on the wild Whooping Crane migration corridor because we believe this important part of the total management effort deserves much more attention. Landowners and other land managers often contact Friends of the Wild Whoopers wanting to know how they can help endangered wild Whooping Cranes. Normally we discuss needs by phone or email. To simplify the process we have developed a brochure to provide information concerning one major and growing need. This need is to properly manage existing ponds/wetlands or develop new ponds/wetlands so that they will attract Whooping Cranes. These amazing birds migrate 2,500 miles two times each year between their Canadian nesting grounds and their winter habitats on the Texas coast. During these long migrations they must stop to rest about 10 to 15 times. While there are about a dozen prime stopover sites on wildlife refuges, migrating Whoopers mostly stopover on small ponds/wetlands on private farms just to rest overnight. Over the years thousands of stopover areas have been destroyed due to changes in land use. As the Whooper population continues to increase there is an increasing need for more stopover sites on private lands. The focus for these ponds/wetlands is in North Dakota, South Dakota, Nebraska, Kansas, Oklahoma and Texas. 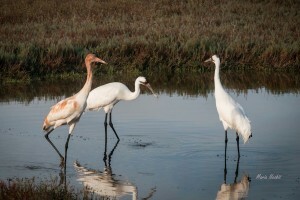 If you own land would you share a small amount with Whooping Cranes? And if you are not a landowner, possibly you could partner with one to help prepare a stopover pond. Ponds can be about any size from one-third acre and larger. The USDA Natural Resources Conservation Service (NRCS) has cost share funding and technical support that will provide dollars to landowners needing assistance. It is also important to know that ponds developed or managed for Whooping Cranes also provide habitats for many other kinds of fish and wildlife. Interested persons are invited to check out our new “Stopover Ponds/Wetland” brochure. It lists features needed in stopover ponds, and provides diagrams to assist you with planning. 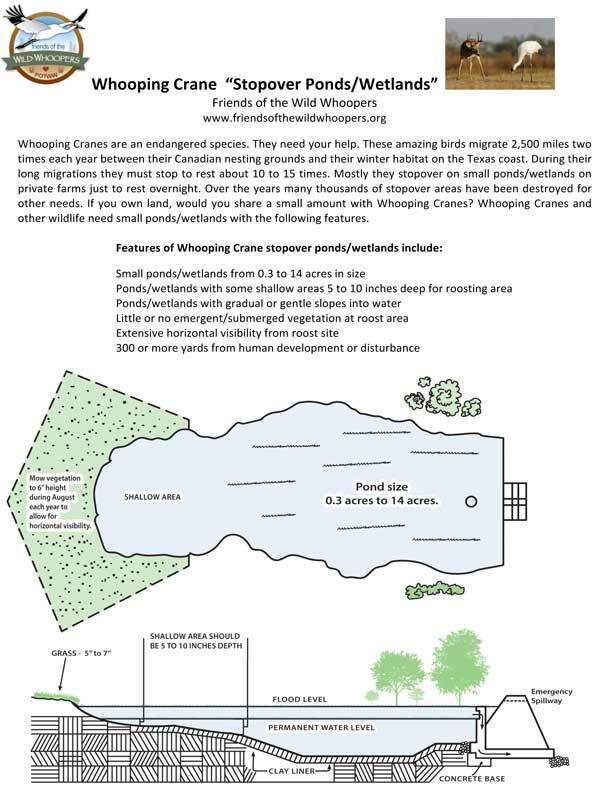 If you would like to download a printable PDF version of the Stopover Pond/Wetlands Plans, click here.